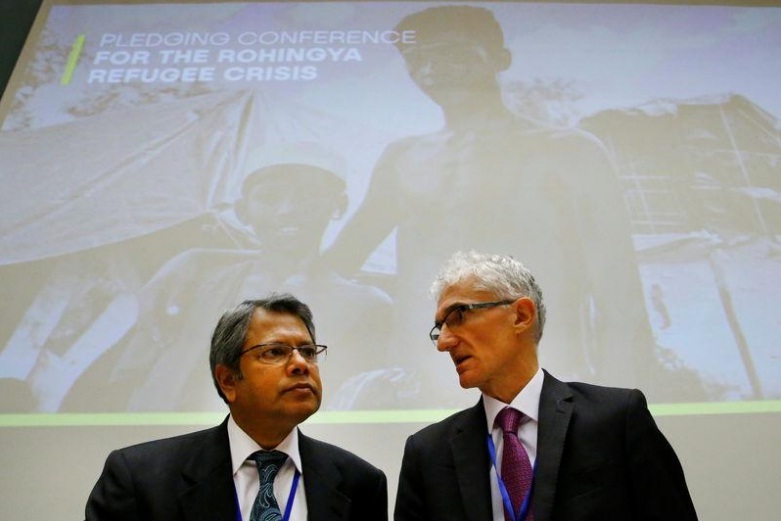 Mark Lowcock (R), Under-Secretary-General for Humanitarian Affairs and Emergency Relief Coordinator (OCHA), talks with Shameem Ahsan, Representative of Bangladesh at the U.N. before the Pledging Conference for Rohingya Refugee Crisis at the United Nations in Geneva, Switzerland October 23, 2017. GENEVA - Bangladesh faces an untenable situation because nearly 1 million Rohingya refugees have fled across its border from violence in Myanmar and its government should let them return home, Bangladesh’s U.N. envoy said on Monday. About 600,000 people have crossed the border since Aug. 25 when Rohingya insurgent attacks on security posts were met by a ferocious counter-offensive by the Myanmar army in Rakhine state which the United Nations has called ethnic cleansing. Any return must be “voluntary, safe and dignified” and conducive conditions have to be “recreated” in Rakhine, he said. “This must include a solution to the question of citizenship, or rather lack thereof for the Rohingya community,” Grandi said. Khaled al-Jarallah, deputy foreign minister of Kuwait which co-hosted the meeting, called on Myanmar authorities to “cease the practice of stripping the Rohingya minority of their right of citizenship, which as a result deprives them of the right to property and employment”. The United Nations has appealed for $434 million to provide life-saving aid to 1.2 million people for six months. “Children, women and men fleeing Myanmar are streaming into Bangladesh traumatized and destitute,” he added. Lowcock said a total of $340 million had been pledged to date, but Grandi later put the figure at $335 million. New pledges included 30 million euros announced by the European Union, $15 million by Kuwait, 10 million Australian dollars by Australia and 12 million pounds from Britain. Bangladesh faces an untenable situation because nearly 1 million Rohingya refugees have fled across its border from violence in Myanmar and its government should let them return home, Bangladesh’s U.N. envoy said on Monday. About 600,000 people have crossed the border since Aug. 25 when Rohingya insurgent attacks on security posts were met by a ferocious counter-offensive by the Myanmar army in Rakhine state which the United Nations has called ethnic cleansing.